Do you ever stop and consider why people make New Year’s resolutions? Sometimes it’s because they want to stop certain behaviors (“I’m going to quit smoking!”) or change themselves (“I’m going to lose 25 pounds!”) or, like so many of us in business, achieve success (“I am going to make my business more profitable!”). Unfortunately, so many of these resolutions never quite make it out of the gate. Why is that? Is it because of a lack of desire or ability? Probably not. 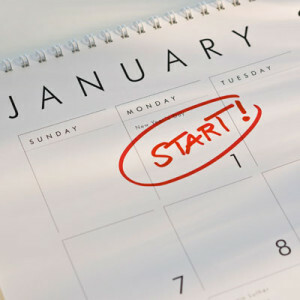 So what is the essential ingredient that so many resolutions lack? If you have a business, naturally you want to make it successful, and the start of every new year can be a new beginning for you. It certainly doesn’t happen, however, by just hoping it will. It doesn’t even necessarily happen if you “just work harder” and go without sleep. The success you seek for your business starts with your marketing plan. From year to year things change. The economy changes, your finances change, you employees may change, your client base may change. All of these changes (as well as many other factors) require you to take an annual assessment of your plan and, in some cases, to scrap your original ideas and begin again. And that’s fine, even good. That’s how your business grows. 1) Take an honest look at your business and set your goals. What is the financial picture like? Have you been in business for years, or are you just starting out? If you’ve been established for a few years, have you been happy with the growth of your customer base, or do you seem to be stagnating? Do you have the resources available to invest in marketing strategies? By asking yourself questions like these, you enable yourself to set realistic goals for your business that align with your business’ situation and your desires for it. 2) Decide how and what you will invest in marketing your business. After determining the overall condition of your business and setting goals that are in alignment with that, you can proceed to the matter and manner of your own investment. While this sounds like a purely monetary consideration (and that is part of it), also to be weighed is your investment of time. Establish your budget for your finances (e.g., how much you will invest in your advertising) as well as your budget for your time investment in marketing (e.g., monthly marketing assessments). 3) Determine the weaknesses in your current marketing strategy. Ask yourself if people are seeing/hearing your message Look, for example, at your website hits or your email list. Are you reaching as many people as you could be? If you are, then how are people responding to it? When they receive your emails, are they opening them? What is your bounce rate on your website? Finally, if you are reaching people and attracting them, are they taking the desired action? Are they making a purchase, visiting your establishment, or seeking more information? By asking these questions, you are better able to see where the missteps may be occurring. 4) Address how to fix the problems you’ve identified. Once you identify where your marketing problems lie, you can look for solutions that work with the current state of your business. Is your problem related to the quality of your website? If people aren’t seeing it, your problem might be SEO related. If people are seeing it, but not utilizing it, perhaps you have technical issues and need to have it upgraded or restructured. Are people not responding to or engaging with your marketing strategies? Perhaps it is a problem of content, such as poor writing or unprofessional appearance, and requires your attention and, possibly, your investment. It is possible that you are finding “holes” in a number of areas of your marketing. This leads to the next step. 5) Form a plan of attack that establishes order based on importance. By drafting a list that is prioritized, you create order and visibility, rather than allowing these ideas to become lost in the whirlwind of your busy days. Having this list keeps these goals and plans in your sight, making them far more likely to be accomplished. Remember, your business is, in a sense, a living, breathing thing. It grows when you give it proper care. It withers when it is ignored. Resolve to make this planning session an annual event so that you can give your business’ marketing strategy a yearly examination that will ensure its continued good health.